After the day of ASEAN Summit in Pattaya was completely destroyed, what else would be left for us as a citizen of the country? 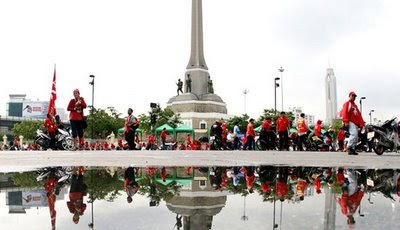 Either your prefer the red shirts or the yellow ones, even you don’t prefer any of them, it is the day all Thai people have LOST so much almost beyond repair. Everyone is Lost. Without any internal political conflicts, every country is already in a deep trouble with the worst-than-ever global recession. Instead of trying to get through the recession with little damage as possible, our politicians keep adding more obstacles……is this really what you called ‘democracy’? 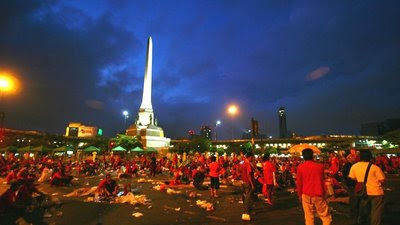 Last Thursday, the red shirts riot began with occupying the main junction of Bangkok, Victory Monument, easily. It caused a super traffic jam for the whole Bangkok metropolitan – you can argue that Bangkok is already super traffic, but imagine it was five times more because of the junction was blocked. Many people were stuck on the streets for hours and hours after their long working days. 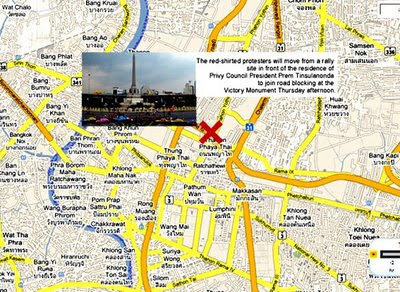 The day after, some of the red shirts went on, trying to do the same, blocking the traffic, at another important intersection of Bangkok financial district, Sathorn-Narathiwas Rachanakarin. However, the mob was thrown away from the intersection right away by the white collar office workers around. Here is the report from The Nation. 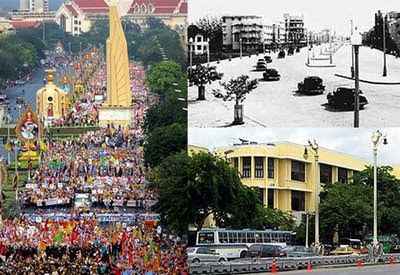 Why are these two places so different, although they are both the main traffic junctions of Bangkok?Big street and political protest are two main characteristics of modern urban space – Marshall Berman explains this issue in depth in his ‘All that is solid melts into airs’. Big street allows people to express their identity and political opinions. It has been a stage for all political protest. However, if we look closely, most of the political-stage big streets are mostly a kind of symbolic one. Take an example of our Rachadamnerd Boulevard, a big street in Bangkok built by the end of 19th century afterHaussman Boulevard in Paris, similar to many other modern cities in the world. It is always a place to express political opinion throughout the history of our democracy. Its symbolism, its scale, its context, altogether are perfect for the event. Here isRachadamnerd Boulevard. 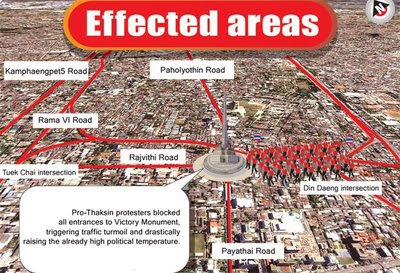 What about Victory Monument and Sathorn?One important aspect about these streets is an actual ‘owner’ of the place. Along Rachadamnern Boulevard, the buildings are pretty much occupied by very quiet business.. nobody really walks along the street (apart from tourists, homeless and some ambiguous businessmen/women). Looking at Victory Monument, it is surely the biggest traffic junctions in Bangkok, where people from all directions passing by to connect their buses. (It is said that you can go anywhere in the country by the minibuses lines around here.) Although hundreds thousands people go through the junction everyday, nobody really ‘owns’ the space……..they are just passers by. While at Sathorn-Narathiwas intersection, it is rather different. The intersection is surrounded by high-rise office buildings. Everyday thousands office workers basically ‘live’ their lives around the area – buying breakfast, having lunch, shopping and hanging out after work- they really belong to the space, they have their own ‘place’. Moreover, the pedestrian bridges crossing over the four sides of the intersection create a very strategic location for the office workers to be above the red-shirt mob trying to block the traffic on the street. The mob inevitably became an exposed target from all the ordinary office workers shouting at them from the pedestrian bridges. You can see clearly how the space is owned by the office workers and how they kicked the mob away from these clips: A, B, C, D, E. They were trying very hard to protect their own ‘space’, their ‘place’ from the unlawful acts. Imagine these office workers who work hard to get through their months paying bills, trying to overcome all the economic problems days and nights. They are no different from a taxi driver, a construction worker, a farmer in the way they also struggle to lead their lives – as we all do… I perfectly understood and imagined myself doing exactly the same thing, if such an incident happens in front of my office. 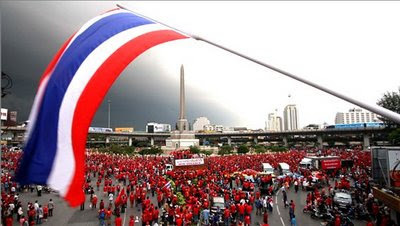 The incident of Sathorn office workers kicking away the red-shirt mob became a very heroic news among the middle-classBangkokians. Right after the incident, the clips above were posed in youtube, all the internet-connected population of the country forwarded the links. In this desperate moment when working-hard middle class like us can’t do anything much with the crisis, the only little example like this give us some hints that perhaps we still have ‘our own space’ in this country. Through these years of our country’s political conflicts, I had never taken any side. The country won’t simply gain democracy through violence and money. Education is perhaps the only tangible but time-taking process, but the impatient Thai could not accept and wait for that. In this precise moment the world became by far too complex, the information/internet technology widens even more the gap between the urban and the rural, between those who have access to information of the global arena and who don’t. This is perhaps the actual effects of the so-called globalization. Since early this year, when this government began to run the country, I could see little light at the end of the tunnel. At least, finally we have leaders who look like what leader should be – not a bandit, not a businessman or a mobster. It might not be a perfect one, but now, in this extreme economic crisis moment, we NEED a government! We CANNOT afford not to have a government, not even for a few months! However, finally, we, hard-working good citizens of the country, are always the one who get the most damage regardless of the winner. Isn’t the country as a whole is also our ‘space’, our ‘place’? How come we let all these occupying our space, our place, our lives? Read a comment on The Nation HERE. 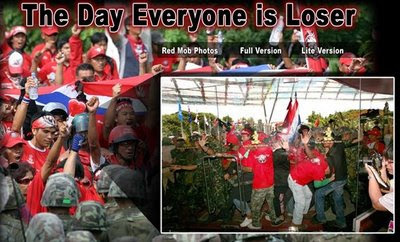 We, the Thai, are all loser now!